Edward Gardiner. A set of five Arts and Crafts Cotswold School ladder back dining chairs, with newly laid rush seats. These ladder back chairs are steeped in history, their design have evolved from a long line of English chair makers going back to the late 17th and 18th century. Edward Gardiner was encouraged to take up chair making by Ernest Gimson who in turn was encouraged by Philip Clissett. Clissett had been making traditional ladder back chairs from as early as 1838, those skills passed down to him becoming a famous master craftsman of his own generation because of his fortuitous connection with the Arts and Crafts Movement and it's call to honest handmade goods. He was discovered by Ernest Gimson who spent a few weeks with Clissett in C1890 to learn the art of chair making which Gimson in turn passed onto Edward Gardiner and encouraged him in around 1904. Gardiner then developed his own art and style of chair making in the traditional way. Always handmade usually from Ash making them quite tactile, extremely strong and durable, yet very lightweight and therefore easy to move around. Clissett was once described by Alfred Powell as resembling, ‘what the old aristocratic poor used to be’. This type of furniture is exactly what the Shakers took with them and what they drew their inspiration from in furniture design when they emigrated to America in the 1770s. I also have four closely matching armchairs in stock which can be seen in my listings. In the last image here I have shown, 'as an example' the most suitable armchair which would go to make a set of six, with three more armchairs available if required. This set of five ladder back side chairs have been recently professionally re rushed, and came to us in wonderful original condition, a wax before hand was all they required. 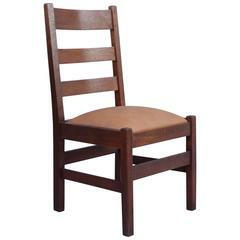 Arts & Crafts period oak side chair with new leather upholstery. 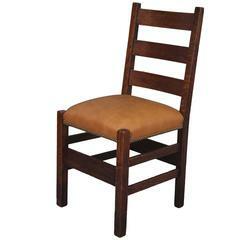 Classic English ladder back dining, kitchen or desk armchair with turned bobblns at the top of each side rail. Double stretchers on three sides adds structural soundness. 1910 Arts & Crafts side chair with newly upholstered leather seat cushion. 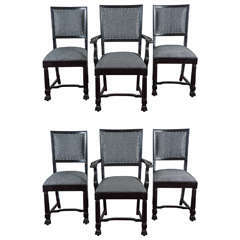 Set of 6 chrome craft high back dining chairs. Chrome frames with thick grey Lucite backs and new gray velvet seats. A striking and very cool set.